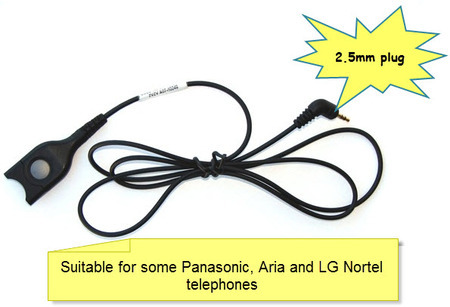 This cable connects any Sennheiser CCxx and SHxx headset to suitable Panasonic, Aria and LG Nortel telephones. This is a 100 cm cable which consists of an EasyDisconnect connector terminating in a 2.5mm, 3 pole jack. The CCEL 190-2 is specifically designed to work with most telephones which have a 2.5mm jack. This cable will connect your Sennheiser headset to many cordless telephones but WILL NOT work with iPhone or Blackberry. For these phones you require the CBB01. Please note: Some Panasonic phones do not have a 2.5mm jack, these require a CSTD24 cable.